I love to make special breakfasts for holidays. It gives you energy to enjoy the day and not just think when will the dinner be ready. Having three kids, I have a lot to get ready everyday – but on holidays there is just so much more. That’s when the breakfast comes in. Fresh from the oven. Mmmm. This dough is very easy to put together. We are not using yeast here so it doesn’t take much time to make. It can be a little sticky, but there is no need for perfection here. Just roll it up, cut and place in a baking dish or on a cookie sheet. Bake and eat. Make the filling the day before. It takes a while to roast the strawberries. These rolls are so delicious! The filling is creamy and perfectly sweet. 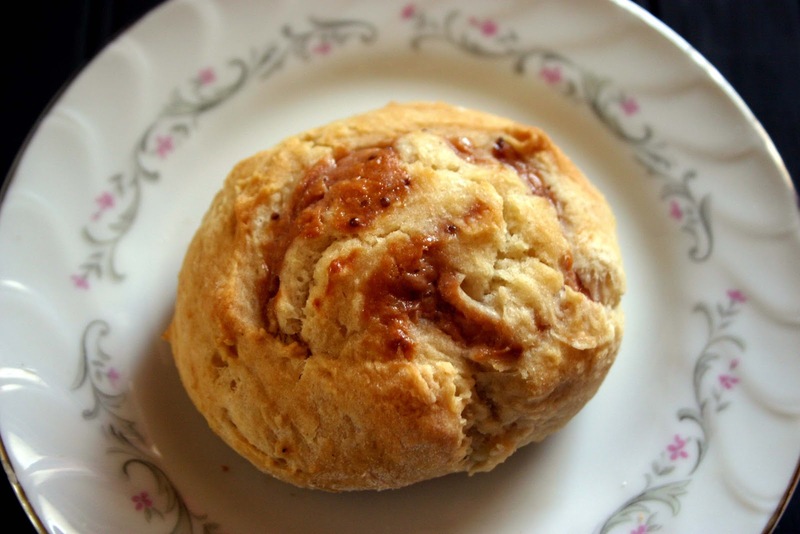 They are best served warm with a cup of coffee or tea and shared with loved ones. Place the sliced strawberries in a baking dish. I used a 9″ x 13″. Roast in a 375 degree oven for about 25 – 30 minutes. Let cool slightly in the dish and transfer into a mixing bowl. Add the cream cheese and mix until everything is smooth and combined. You should try it at this point to decide if you need to add any sugar or not. Preheat your oven to 350 degrees. Lightly grease a 13″ x 9″ baking pan. Set aside. In a large mixing bowl, whisk together the dry ingredients ( flour, sugar, baking powder and salt ). Using your pan as a guide, roll the dough out into a rectangle. I hope you all will have a fabulous weekend, my friends! PS: Don’t forget to enter the giveaway! You can win the dessert decorator. It’s a fabulous gadget! Click here. This is so brilliant! I am drooling over just the thought of these! Roasted strawberries?! You are SO cool! I have not had this kind of a roll before but they look and sound delicious. I'm sure the strawberries add a very special sweet flavour. Roasted strawberries is such a new twist but it sounds divine with cheese in those delicious looking rolls. Well done! Hello Anna,rolls are delicious and yum.lovely pics. I liked your blog..Happy to follow you dear.Do visit my blog in your free time. Thank you so much, Pranjali! Welcome to CCS! These sound amazing! 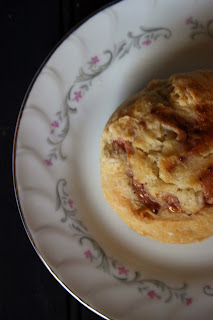 Sweet rolls alone are delicious but the strawberries make these heavenly! How perfect for Easter :)! They are very easy to make! You can have a plate full of these fresh babies in no time 🙂 Thank you! We were just saying at Easter dinner that everything is better with a little cream cheese! This is clearly no exception. I have no idea how you keep up with cooking and your wonderful blog with three little ones at home. I have a hard time keeping up with just one. You're amazing Anna! This looks and sounds delicious!! Happy Easter!!! Thank you 🙂 Happy Easter to you too! Hi Anna, this recipe sounds great. I love making sweet rolls, so will have to try this out on the other half. This sounds so yummy with cheesy berry filling! These sweet rolls sound delicious. Roasting strawberries… what a wonderful idea. 🙂 Have a fantastic Easter with your family Anna!! Anna, these sound absolutely delicious! What a delicious treat! Thank you so much, Kit! Happy Easter to you! These look amazing – I wish I could have these for my breakfast 🙂 Love the combination of strawberries and cream cheese! So should I pack away a dozen or two? 🙂 Thank you! Thank you so much, dearest Serena! Well you certainly know how to amp of the flavor of these rolls. Love the addition of the strawberries and cream cheese. I wish these were at my house instead of yours-yum! Enjoy your celebration with family and friends this weekend! Thank you so much, Tina! The roasted strawberries filling is divine – I hope you will try it. Hi CCS, I've always learned something from your blog! I like this recipe! Happy Easter to you & your family too! Thank you, Jessie! Happy Easter! I love the weekends as that's when I roll out the special breakfasts 🙂 These look like they'd be awesome with my coffee!! Thank you, Gerry! Welcome to CCS! I hope you will try these. oh my god these look fantastic! definitely bookmarking this! OMGoodness! I want this now !!! I love everything that has strawberries in it, with it, near it, lol and am making a strawberry dessert today, too! Those rolls looks so delicious! Happy Easter! Thank you, Marina! Happy Easter to you!